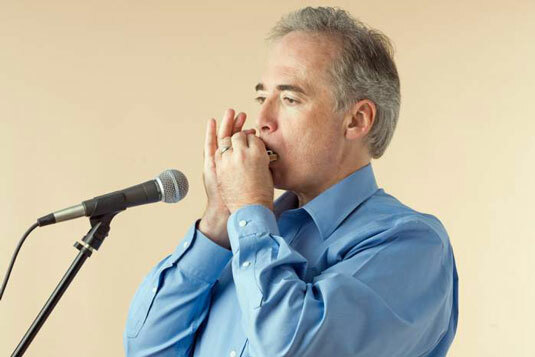 The first time you play harmonica with amplification, you’ll probably play into a microphone that’s connected to a sound system. Usually the mic will be a vocal mic — a mic you would use for singing. And that’s fine; mics that work well for vocals usually work well for harmonica. 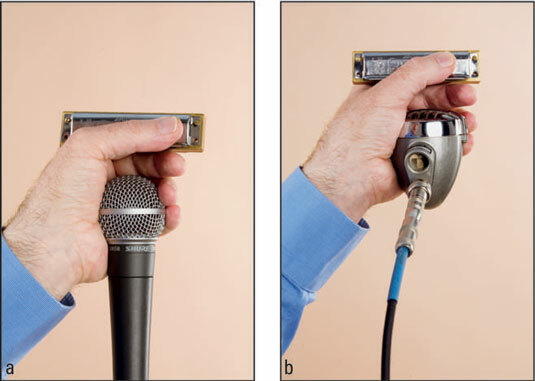 When you play harmonica through a sound system, the microphone is usually on a stand, ready to amplify the voice of someone speaking or singing (or playing harmonica). Here are some pointers for getting the most out of using a mic on a stand to play tharmonica. Adjust the mic stand. Make sure to adjust the stand so that the end of the mic is at the same height as your mouth. You don’t want to scrunch down or stand on tiptoe to reach the mic — you’ll be uncomfortable and you’ll probably look strange to the audience. Position the mic. To maximize sound pickup of your microphone, point the length of the mic directly at the sound source. Your sound source is the back of your hands if you’re holding the harp, and it’s the back of the harp if you’re playing Bob Dylan style with a neck rack. Position yourself in front of the mic. Get close to the mic so that it can get a strong signal. If you start to hear a loud howling noise, that’s feedback. Back away from the mic until the howling stops. Otherwise, you should get nice and close. Make room for your hands. An important part of the acoustic harmonica sound is the use of your hands around the harmonica. (Cupping and uncupping your hands makes the harp sound bright and dark by turns and makes vowels sound like “wah.”) Leave enough room for your hands to move without hitting the mic. Your first microphone experience may not involve a stand, however. Someone on the stage may hand you a microphone to cup in your hands along with the harmonica. In that case you need to know how to handle the situation. Harmonica players often cup the harmonica and the mic together in their hands (perhaps a vocal mic or a bullet mic). Cupping a mic when you’re playing through a sound system gives you a sound that’s similar to that of a natural harmonica, but stronger and more concentrated. The sound is louder than if you don’t cup the mic. Other loud sounds, such as drums and electric guitars, won’t get into your mic. You can move around the stage and still be heard because the mic goes where you go. You have less ability to shape tone with your hands because the mic now occupies the space needed to create an acoustic chamber. The difference between loud and soft sounds is less pronounced. The tone of your harp will be different. High frequencies become less pronounced, giving your tone a darker, mellower sound. Don’t grab a mic to cup in your hands without letting the sound tech know first. He needs to know so he can turn down the volume on that mic. Otherwise you may hurt everyone’s ears and even damage the speakers, either with some very loud harmonica notes or with feedback. Always hold the mic one finger width away from the harp. Doing this keeps the harp from bumping the mic and making noise. You also create a small tone chamber that you can work for tonal effects by changing the shape of your hand cup around the harp and mic. The first time you play on stage, you may have a difficult time hearing yourself and other players because of loud amplifiers, audience noise, and the distance between you and the other musicians. And when you can’t hear yourself, you may lose your place on the harp and play wrong notes. However, a good sound system provides monitors, which are little speakers on the stage floor that are aimed up at you so you can hear yourself. If there’s time before your performance, ask the sound tech to do a sound check. Request more volume in the monitors. Motion to the sound tech by first pointing to your ear and then pointing upward. This tells him to raise your volume level in the monitor. Put a finger in your ear. If all else fails, a finger in your ear helps you hear your playing or singing. Hold the harmonica in one hand, and then use your other hand to create your body monitor. With high sound levels on stage, you may feel overwhelmed, and then you may start pushing too much air into the harp. Resist the urge to honk, screech, or beat up on the harp. If you play at a normal level, you’ll have better control of the harp, and you’ll sound better too. Feedback is the painfully loud howling sound that overwhelms a room when a microphone “hears itself.” Feedback happens when the mic picks up a sound, feeds that sound through a speaker, and then picks up the same sound again and starts feeding it back through the system again. When speakers and microphones are pointed at each other. When amplifiers are so loud that mics pick up sounds no matter which way they’re aimed. When a hollow space amplifies certain frequencies and makes them ring.